The Pentagon already consumes a lion’s share of the United States federal government’s $1 trillion discretionary spending budget—almost $700 billion today. After the recent news that the Pentagon has failed its first-ever financial audit, it’s clearer than ever that the Department of Defense is unable or unwilling to account for where staggering amounts of its money are going. And yet, just the day before the release of the audit results, a report issued by the bipartisan National Defense Strategy Commission called for Congress to approve annual increases of three to five percent in the Pentagon budget above inflation. That could result in military spending of nearly $1 trillion in 2024 at the high end of projections—$972 billion, according to data from Taxpayers for Common Sense. One of the authors of the “Providing for the Common Defense” report is retired four-star Army General Jack Keane, who is often touted as a possible replacement for Defense Secretary Jim Mattis. If Keane were to head the Defense Department, the report could offer detailed insight into his intentions for the U.S. military. The report raises the specter of a looming “national security emergency” that justifies the massive military spending increases, perhaps related to the eruption of open American wars with China, Russia, Iran, or North Korea. The commission calls for expansions of most military forces, warning that the United States is “at risk of being overwhelmed should its military be forced to fight on two or more fronts simultaneously”. That’s in addition to demanding a budget that sustains the troop deployments for ongoing wars in Afghanistan and throughout the Middle East, which have already cost $5.9 trillion since 2001 and directly caused at least 480,000 deaths, according to recent studies by the Costs of War Project. "Rather than viewing defense cuts as the solution to the nation’s fiscal problems, Congress should look to the entire federal budget, especially entitlements and taxes, to set the nation on a more stable financial footing." This is despite the fact that federal government agencies that administer safety net programs are subject to much greater scrutiny than the Pentagon, regularly undergoing audits that confirm whether spending matches budget appropriations. The report from the congressionally mandated commission is just a recommendation, which will compete with many other national priorities throughout the messy annual federal budget process. But its rhetoric could embolden national security hawks in Congress to pit the supposed needs of the Department of Defense against federal programs that meet human needs and are far more accountable to taxpayers. Sustained reforms, implemented across every aspect of the Department’s activities, are sorely need to bring one of the world’s largest bureaucracies into line with 21st century business practices... We believe the Department should continue to pursue reform on its own merits, to enhance competitiveness and assure taxpayers that their tax dollars are well-spent. Yet DOD and Congress must understand that even the most optimistic advocates of reform cannot identify sufficient savings to make this approach a reliable source of real growth in defense capability. That's an interesting framing. 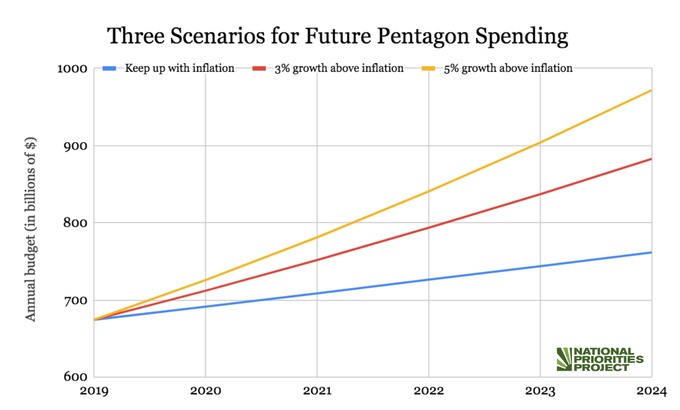 They simply assume that any savings from organizational reform and increased bureaucratic efficiency will be funneled to more military spending—and then they demand money for more growth. Maybe it’s time to “alter the expectations of U.S. defense strategy and our global strategic objectives,” as the commission report threatens is necessary if Congress doesn’t give Pentagon the three to five percent raise they want. Instead of framing Pentagon reform as a way to grow more "defense capability," maybe it's time to cut off Pentagon funds and stop the march to war. The United States already spends more on its military than the next seven countries in the world combined. Even if the Department of Defense had passed its audit and could properly account for its current budget, it’s increasingly absurd to suggest that runaway Pentagon spending to perpetuate endless wars and profiteering by weapons contractors is actually boosting national security. If the Pentagon doesn’t know where $700 billion is going, why should taxpayers trust them to do any better with $1 trillion?